DESCRIPTION – The creel rack has a number of wooden shelves on which the internal unwind rovings are stood. Each roving has an individual set of guide eyes located on the underside of the shelf above. Mounted on the front end of the rack are the tensioning devices. The tension device consists of a two sets of interlocking polished rods. 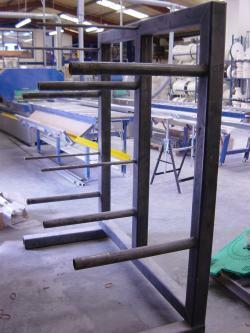 The bottom set are fixed, while the top set are mounted on a pivoting framework. The degree of interlocking can then be varied to give differing fibre tensions. The top rod framework has an adjustable locking device fitted with a linear scale. This can fixed in position by means of a locknut. Mat stands are, in general, installation specific and are custom designed to suit the specified product ranges and pultrusion machine configuration.